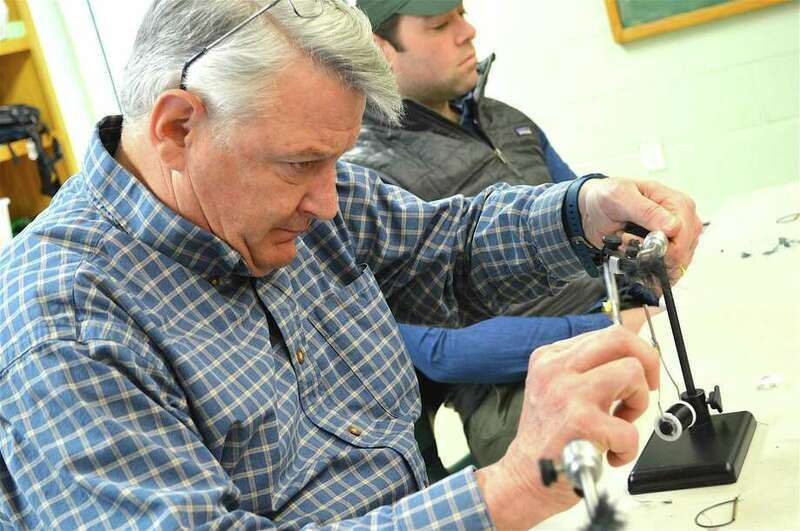 Dan O'Brien of Fairfield concentrates on the work at the Intro to Fly Fishing at the New Canaan Nature Center on April 8. Diocese of Bridgeport Bishop Frank J. Caggiano will deliver the commencement address at Sacred Heart University’s 51st undergraduate commencement exercises May 14 at 10 a.m. He will also receive an honorary doctor of theology degree. The university’s graduate commencement will take place the day before. Both ceremonies will be at the Webster Bank Arena in Bridgeport. Sacred Heart’s class of 2017 includes 890 undergraduates who will have earned bachelor’s degrees and 1,026 graduate students who will have earned master’s degrees, professional certificates and doctorates. Members of Sacred Heart’s first graduating class — the class of 1967 — will participate in the procession to celebrate the 50th anniversary of their graduation. Sacred Heart was founded in 1963 as an independent, Catholic university by the Most Reverend Walter W. Curtis, Bishop of the Diocese of Bridgeport. It is the second-largest Catholic university in New England and was the first in America to be led and staffed by laypeople. Horizons at Sacred Heart University marks its sixth year with a special celebration featuring folk singer Tom Chapin and honoring a Fairfield couple on April 22. Horizons at SHU’s second annual gala will feature a night of food, drink and songs, including a special presentation from the Horizons students at the Sacred Heart’s Martire Business and Communications Center. Horizons at SHU’s honorees this year are Grace and Ruben Rodriquez, longtime residents of Fairfield who fled Cuba in 1959. Ruben Rodriquez, who died last year, was the CEO and chairman of Bacardi. Chapin, a three-time Grammy winner, will perform classics such as “This Little Light of Mine” and “This Land is Your Land” with Horizons SHU students. Chapin will end the night with “Pretty Planet” to honor Earth Day. Tickets for the event can be purchased at http://alumni.sacredheart.edu/HorizonsGala. In celebration of Earth Day, which is April 22, Fairfield-based nonprofit Humanity Now will sponsor a town-wide cleanup. Students, residents and community groups will work together, picking up trash and collecting donations tied to the students’ service work. The Gould Manor Park area (including the underpasses). Humanity Now is seeking volunteers from the community to adopt pre-designated areas or join existing groups of volunteers. Work gloves are recommended and trash bags will be provided by the town. During the cleanup, Humanity Now will also be raising both awareness and collecting donations to support bringing clean water to undeveloped countries. Proceeds from the recycling of collected bottles and cans at area Stop & Shop stores, which will be generously matched by Aquarion Water Company, will be used to buy water filters for a partner community in Ecuador. Each $35 filter is capable of turning one million gallons of river water into clean, drinkable water, removing the risk of diseases like cholera and typhoid. Recycled bottle receipts will be collected on April 22 from volunteers and at the Stop & Shop at 1160 Kings Highway Cutoff in Fairfield. Donations are also accepted. The clean-up is also being held in anticipation of the Fairfield Earth Day Committee’s celebration, which will be held the following weekend, on April 30 from 10 to 3 p.m. at the Fairfield Theatre Company, 70 Sanford St.
For more information on volunteering and donations, contact Don Morrison at info@humanitynow.us or 203-256-0353. The Rotary Club of Fairfield raised more than $17,000 during its most recent “celebrity luncheon” event at the Bridgeport Holiday Inn last month, featuring Jon Miller, president of programming for the NBC Sports Group. With hundreds on hand for the 14th annual event, which is the largest fundraiser of the year for Fairfield Rotary, Miller talked about the evolution of television sports. On April 17, Fairfield resident Joel Green is running to conquer cancer as a member of the Dana-Farber Marathon Challenge team in the 121st Boston Marathon. Along with more than 500 Dana-Farber Marathon Challenge teammates from across the United States and around the world, they will run Massachusetts’ historic marathon route from Hopkinton to Boston to collectively raise $5 million for cancer research at Dana-Farber Cancer Institute. This year marks the 28th annual running of the Dana-Farber Marathon Challenge team. Dana-Farber Marathon Challenge runners who are not time-qualified for the Boston Marathon receive an invitational entry into the race. Each team member must fulfill a basic fundraising commitment of at least $4,000. The Fairfield Chamber of Commerce, together with the Greater Norwalk, Westport-Weston and Danbury chambers, will be taking a group trip to the scenic Danube River, stopping at imperial cities along the way, departing Sept. 28 and returning Oct. 7. Chamber members, guests, family and the public are invited to visit one of the most spectacular rivers in the world, the Danube. Included in the trip are stops in Munich, Passau, Melk, Vienna, Budapest, Bratislava and Linz, with an optional, three-night extension stay in Prague. Chamber trips are affordable, while providing the same high-quality travel of other tour groups. Each city boasts unique and beautiful architecture, fine culture and specialty stores for shopping. On board the ship, with only 71 cabins, providing comfort without crushing crowds, guests experience superb dining with all meals included during the cruise, including complimentary, quality red and white wines from Europe’s great wine regions with every dinner onboard the ship. The starting price is $4,199 for double occupancy. If interested in learning about the trip, call the Fairfield Chamber at 203-255-1011.